We often want to add things to the content of a node or any other entity in Drupal 7 using hook_node_view(), hook_node_view_alter() or a similar hook in a custom module. This could be anything from a custom social media link, a field rendered in a custom way, additional author information or virtually anything else. * Adds a Facebook like button to page nodes. These extra items nestle in alongside fields on the node, so can be considered 'pseudo-fields', but on their own are totally inflexible as they can't be repositioned and seem to appear out of nowhere onto the page. 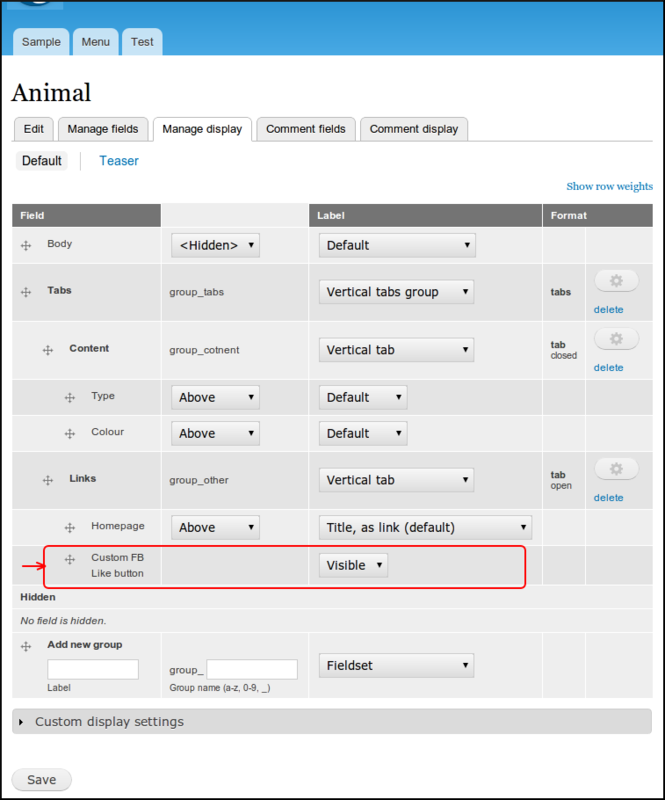 You should give yourself or site owners/administrators as much power as possible to customize content - and there is an easy solution here, to allow your extra content to be repositioned in exactly the same way as standard fields in the manage fields/display UI can be. 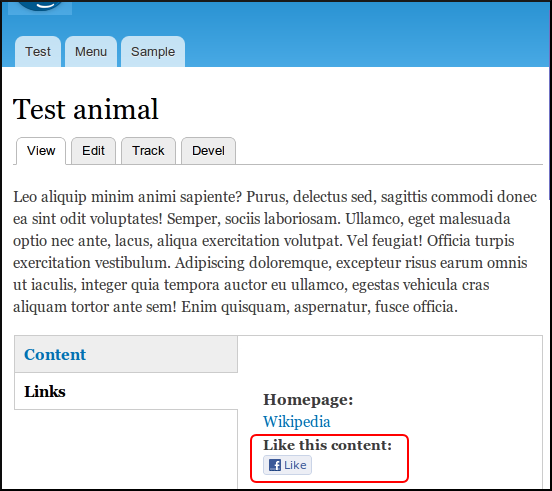 * Declare our Facebook Like button as a pseudo-field. // entity type, bundle and then either 'display' or 'form'. // In this case, we apply to 'page' nodes, when we display them. 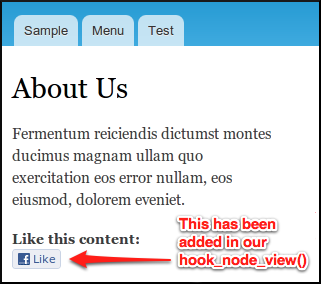 // that we add in our hook_node_view() or similar function. // with anything from other modules. Either specify 'display' or 'form' depending on whether your extra content is shown on the displayed content (which is what we do in this example), or the create/edit forms of the content. Most of this article is talking about adding pseudo-fields to the display of content, but have a look at the Domain Access module as an example of an extra item on the form -- see domain_field_extra_fields() -- which it uses to add the domain settings for specific nodes. 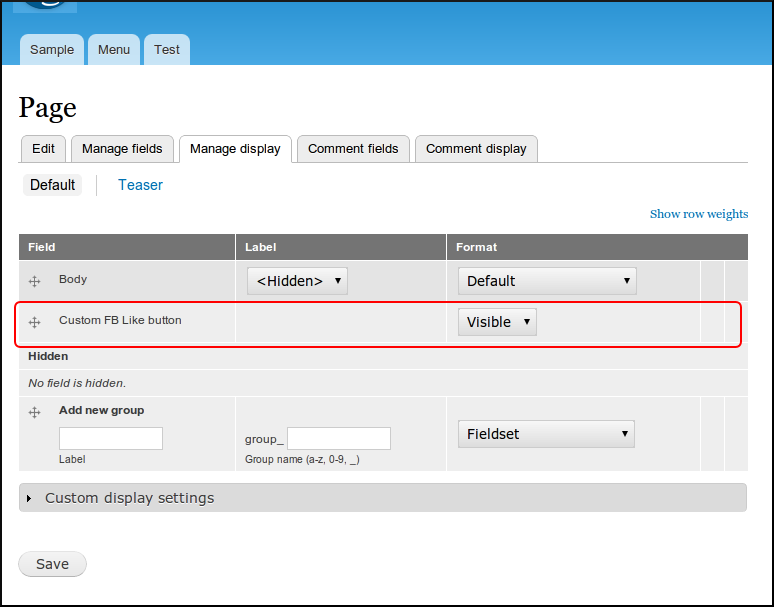 The label is only what is shown in the manage fields/display settings screen, it is not used on the actual content. The description doesn't seem to get used anywhere so is useful as documentation for anyone that reads your code. I would recommend referring to which function adds the pseudo-field to the content as that's not always obvious. If you've added the hooks above to your own module, make sure you replace 'MYMODULE' with your own module name, and flush your site caches for Drupal to pick them up (or just enable the module). There are of course some alter hooks for extra fields: hook_field_extra_fields_alter() and hook_field_extra_fields_display_alter(). If you wanted to export these display settings with something like features, the giant field_bundle_settings variable stores all the settings for all entities / types / bundles / view modes. Note that all this applies to any fieldable entity, so you can do the same for users, taxonomy terms, etc! While this article has focussed on Drupal 7, the same things can be achieved in Drupal 6 with CCK and hook_content_extra_fields().